We’d love your help. Let us know what’s wrong with this preview of Autism Breakthrough by Raun K. Kaufman. As a boy, Raun Kaufman was diagnosed by multiple experts as severely autistic, with an IQ below 30, and destined to spend his life in an institution. Years later, Raun graduated with a degree in Biomedical Ethics from Brown University and has become a passionate and articulate autism expert and educator with no trace of his former condition. So what happened? Thanks to The As a boy, Raun Kaufman was diagnosed by multiple experts as severely autistic, with an IQ below 30, and destined to spend his life in an institution. Years later, Raun graduated with a degree in Biomedical Ethics from Brown University and has become a passionate and articulate autism expert and educator with no trace of his former condition. So what happened? To ask other readers questions about Autism Breakthrough, please sign up. I'm pretty split about this book. I do like the format and I think the suggestions for how to help children with autism are spot-on. However, I was really turned off by the beginning. The author claims to have had severe autism as a child, but "recovered" from it with the help of his parents. If he had mild autistic tendencies, I could believe that he recovered from autism, but I find it very hard to believe that someone who was severely autistic can overcome it. He claims that the methods in th I'm pretty split about this book. I do like the format and I think the suggestions for how to help children with autism are spot-on. However, I was really turned off by the beginning. The author claims to have had severe autism as a child, but "recovered" from it with the help of his parents. If he had mild autistic tendencies, I could believe that he recovered from autism, but I find it very hard to believe that someone who was severely autistic can overcome it. He claims that the methods in this book can help cure children with autism, as if autism is something that needs to be cured. I do believe children can make tremendous progress with these methods, but autism is a lifelong disorder and cannot be cured. Why do people want to cure autism? We don't think that kids with CP or Down Syndrome need to be "cured" because we know that they are lifelong disorders. I know kids with autism and they are some of the sweetest, most lovable children. Why do they need to be "fixed?" They are perfect just the way they are. The author knows that parents of autistic kids love their children no matter what. That's great, but why would they want to get rid of who they are if they love them the way they are? I found the words 'recovery' too insulting. My daughter isn't diseased nor needs a cure. Having said that, not one kid is the same on the spectrum. There are many ways to help behaviors and developmental delays. We used ABA for the past few years. It has done wonders for my girl. Not all ABA is the same. Parents need to do their research. Describes in great detail the methods used at a center in Massachusetts where he works, and that were developed initially by his parents in "curing" author's autism. Emphasis on autism as a social-relational disorder. Lots of positive anecdotes from their workshops and such, and most or all sounded very reasonable (setting aside a "focus room" in the home with no electronics for interactions in which the child gets to be in control, but where getting what they want (e.g., a particular toy) requi Describes in great detail the methods used at a center in Massachusetts where he works, and that were developed initially by his parents in "curing" author's autism. Emphasis on autism as a social-relational disorder. Lots of positive anecdotes from their workshops and such, and most or all sounded very reasonable (setting aside a "focus room" in the home with no electronics for interactions in which the child gets to be in control, but where getting what they want (e.g., a particular toy) requires social communication). He takes considerable pains to differentiate it from applied behavior analysis, though some of the recommendations (expressing great enthusiasm when the child makes eye contact or speaks in a way that shows interest in others.....ignoring tantrums and pretending not to understand what s/he wants) were totally consistent with ABA. Kind of disappointing to get to the end and realize that this program they've been using for decades and that has received this or that "best therapy" award etc. has such a slim empirical basis. He reproduces in full a review article showing that various principles (e.g., "create an optimal physical learning environment") they believe the program instantiates are plausible, but the actual database of controlled studies on the program itself appears to consist entirely of a study of 6 kids aged 4-7 getting the program for 5 days (40 hrs. intervention) vs. 6 controls with autism, and measured immediately after treatment the experimental group was more engaged in a test social task. That's terrific, but a long way from showing that the program has lasting curative effects for all ages, all along autism spectrum, that the diet recommendations in the book are helpful, etc. I was given a copy of this book from netgalley in exchange for an honest review. As a therapist, I find these kinds of books fascinating. This was no exception. Raun K. Kaufman's parents were told that he had an IQ of 30 and a o% chance of ever speaking. He was diagnosed with autism. Now, because of a program that his parents used with him, he exhibits no autistic tendencies...in fact he wrote this book! What I liked: The book is written in a conversation style with stories about real people and h I was given a copy of this book from netgalley in exchange for an honest review. With a prevalence of 20% of children having ADHD in USA it's not impossible to imagine they don't diagnose Autism very thorough. 1. Premature diagnostics is idiotic. 2. Children (in this book) with similar temporary problems do get a lot of help when you educate parents to this extent. 3. It also shows that the writer (and all involved) is completely identified in the myth that they had Autism. 1. That the money involved in their business makes it completely i With a prevalence of 20% of children having ADHD in USA it's not impossible to imagine they don't diagnose Autism very thorough. 1. That the money involved in their business makes it completely impossible to critizise. Who cares?! People get help. 1. Scientists and clinicians to make better diagnoses in the future, and exclude some criterion. Some good ideas put forward here worth a read for that alone. The strategies were easy to understand. The only problem I have is the difficulty with which to implement these techniques optimally. Regardless, the ideas in this book regarding autism were very welcome eye-openers. I "read" this via audio book but it took a short time to get into the author's voice and speech pattern. I am so glad I did! By the time I was a couple of chapters in, I was so excited to learn techniques and strategies for my son. Plus there is a whole lot of encouragement for the parents. I am going to buy this book but I'm thinking about buying the audio version as well. It was that good! This book has some useful strategies that parents can use with their kids with autism. However, I think that this book tries to market for Son-Rise Model, and tries to say that this model is the cure for autism!. The book kinda gives parents some false hopes. And definitely represents ABA therapy as not effective, which is not accurate by any means..! These are startling statistics and should awaken anyone who reads them to the fact that Autism is a serious medical condition that desperately needs to be addressed from the highest levels of authority to the lowest, in churches, synagogues and mosques, and in nuclear and extended families. To put a fine point on this: as someone who works with students who have an autism spectrum disorder, I welcome research, interventions, and ideas from any place I can get them. These statistics are even more startling when the field is narrowed to the 1 in 42 boys and boys are 5 times more likely than girls to have autism. It seems as though every day there is a new statistic appearing in the news about autism. So I'm not sure, honestly, what to do with some of the information that I, as a trained professional, read on a daily basis. In the statistics above, Autism Speaks states fairly confidently that 'there is no medical detection or cure for autism.' Yet on page two of Autism Breakthrough Kaufman states unequivocally: "Children on the autism spectrum are capable of great change including recovery" (2). So what is one to do with such disparate points of view? Is it a matter of merely splitting the hair of difference between the words 'recovery' and 'cure'? Is it merely a matter of having super-human parents who love their children into some sort of neurotypical wholeness? Is it merely a matter of having enough faith to distrust what medical science has told us, what scholars (in the sense of peer-reviewed writing) have written to us, and what most advocacy groups teach us about autism spectrum disorders and going off in direct and absolute contravention of these specialists to do our own thing--a sort of 'damn the torpedoes' kind of approach? These are some of the thoughts that were swirling around in my head by the time I finished reading Autism Breakthrough. Another significant collection of thoughts I had was this: Suppose I am a parent whose child has just been diagnosed with an ASD. Suppose I have no idea what to do, where to go, or what steps to take? Suppose I have two sets of information in my hands. One set of information says that my child can recover, the other states it is a lifelong condition. One set of information is from the collected works of established medical science, the other set is from an outlier. One set gives me hope and so does the other. What on earth am I supposed to do? Here, I think, is the crux of the issue with Autism Breakthrough: I think there is a huge difference between selling a set of interventions and selling a cure (or recovery). At the end of the day, I have no problem accepting that what is written in this book might very well be a set of outstanding interventions for children (or adults) on the Autism Spectrum Disorder. As I noted above: I work with students on the ASD every single day and I happily welcome any and all interventions that might help my students and/or their families. Nevertheless, I think it is somewhat irresponsible to suggest that what is contained within the book could lead to a 'recovery' or a 'cure.' I think it's even worse when said 'recovery' is set over and against accepted, evidence based practices such as applied behavior analysis. There are many, many interventions that may prove helpful to families facing an autism diagnosis and I think each family will have to explore these options and decide, along with their doctor, which interventions are appropriate for their situation. Now, on to a couple of finer points of criticism and praise. First, there is undoubtedly a level of enthusiasm in this book that stands in stark contrast with what one normally reads concerning autism. If points could be awarded based on enthusiasm alone, I would rate this book very highly. The last chapter of the book deals with attitude and I happen to agree that attitude is extremely important when dealing with any disability. The author of the book works very hard to make certain that people are given hope and encouragement in the face of what might otherwise be devastating news from a doctor. I tell my parents this all the time: have hope! We will work through this difficulty together. Second, at the end of every chapter there are links to additional online resources. There are additional papers, charts, and resources that will provide extremely helpful to the family needing to track behaviors or 'stims' or other issues their child may be experiencing. Collecting data is a significant factor when determining interventions for children and I found the extra resources helpful and appropriate. Now for a couple of minor criticisms--aside from what I have already mentioned in the above sections. First, as noted above, autism spectrum disorders affect boys nearly five times more than girls, yet throughout this book the author persisted in using feminine pronouns (she, her) when talking about children. It's a small thing, but it was extremely annoying for precisely that point: autism affects more boys than girls. Yes, we live in a world where we need to be sensitive to everyone's concerns, but I just wonder who the author was writing to? In this respect, it's not a small thing. If the majority of children on the AS are males, then stick with using pronouns that are appropriate to the population being addressed. As far as an intervention is concerned, I am sure the Son-Rise Program (the catalyst behind the writing of this book) is effective for some children and/or adults. There are a lot of positive and encouraging words and anecdotes contained in the book which makes the book not only an easy read, but also an uplifting book. Personally, I think some of the interventions are wonderfully conceived--I especially like the idea of 'joining' and plan to implement it, to the extent that I can, in my classroom. I absolutely agree with the idea that we have to persist in our efforts, believe in our children, love our children deeply, a 'nonjudgmental and welcoming attitude' (249), provide them with everything they need (including, if a doctor deems it healthy and necessary, dietary restrictions), and a generally positive and safe environment where they can grow, be themselves without fear, and develop. I also agree that how we do things matters to: "We remain married to the idea that, in the therapeutic and educational setting, the only thing that matters is what we do, rather than how we do it" (254). Amen. Attitude matters--at home and in the classroom; bank on it. I'm sure there is more to say--positively and negatively--about the book itself. I am also sure that someone is going to say it, somewhere, and at some point. My overall impression of the book is very simply this: If you have met one person on the autism spectrum, you have done just that: you have met one person. I suppose we could say that for as many people that there are on the Spectrum there might be developed an intervention. My point is that these interventions might work very well for some, they might not work for all. As with all interventions--and I think it is unfair to disregard ABA interventions out of hand as if they have never worked--Son-Rise Program needs to be investigated by each family that wishes to consider it for use. In coordination and consultation with a licensed physician, it is important that all due diligence is done in advance before any intervention is put in place. I hope the author of Autism Breakthrough would say as much himself. As another tool in the tool belt of interventions, I think this is a worthy volume. It is very comforting to have a book that understands the psychological aspects of being both a child on the spectrum as well as a motivated caregiver later in life. This unique perspective works wonders for anyone trying to understand an afflicted child’s world. I appreciate greatly the guidance and stories from the Son-Rise program. It provides a much needed and refreshing alternative to the well-known ABA therapy program. The most important thing that society needs to change is attitudes towards this condition and know that it is definitely not Alice sentence. Our children are capable of so much more only if we adopt the right attitudes in working together to understand their sensibilities. Only by engaging with them in this manner will we get lifelong and sustainable improvements against Autism in general. I find it so interesting that modern doctors are so quick to pass judgement and label our misunderstood children however they are not interested in helping to find the root cause of an obvious health problem. لازالت اذكر المناقشة السريعة بيني وبين أستاذتي عن هذا النوع من التدخلات، أفكار راون كوفمان كانت تبدو بسيطة وطبيعية جدًا لكن قدم المنهجية مع قلة التعريج نحو فاعليتها مثار للتساؤلات! بالنظر الى الفكرة والاجراءات وحدها فهي تبدو جديرة بالتجربة، لكن لقدم التدخل نطالب الكاتب ان يقدم ادلة علمية تثبت فاعلية تدخله! فكلنا نعرف ان ما يصلح للعاديين قد لا يصلح بالضارورة لذوي التوحد. ومن هذا المنطلق علينا التحري. الكتاب يشرح منهجية صن رايز بوضح، لاحظت انه يهاجم مدخل تحليل السلوك بينما هو نفسه يستخدم بعض تقنيا لازالت اذكر المناقشة السريعة بيني وبين أستاذتي عن هذا النوع من التدخلات، أفكار راون كوفمان كانت تبدو بسيطة وطبيعية جدًا لكن قدم المنهجية مع قلة التعريج نحو فاعليتها مثار للتساؤلات! الكتاب يشرح منهجية صن رايز بوضح، لاحظت انه يهاجم مدخل تحليل السلوك بينما هو نفسه يستخدم بعض تقنياته.. This is an intense and amazing look at a mind that was diagnosed with autism. Once one grasps that--though the meat is the same for everybody--the squishy digital mind that is created is different and unique for each person, afflicted with ASD or not. Thus, the use of the word "afflicted" is really a misnomer, as who are we to say what is a correct brain and what is not. Fascinating read. Should be followed with his father's two books named "Son Rise". It was hard to choose a rating for this book, since I haven't put into practice any of its teachings, but it made a lot of sense. I plan to re-read the book, paying more specific attention to the parts that apply to my high-functioning autistic grandchildren, and see if those techniques help me and them. I have mixed feelings about this book, it has some very great advise and I love the idea of the Son-rise program but I have a hard time believing that he is "cured" of autism! Amazing! Inspiring! Full of hope for our son! Life changing because it taught me that everything I know in the world of autism has been turned upside down. An interesting and informative read! Very helpful and hopeful advice. Great for parents of young autistic children. Mine are 22, 15, and 6. This came across my desk as an audiobook, so of course I had to go track down the book. Raun is the same autistic child who was the focus of the book Son-Rise in the early 70’s. And the most amazing thing about that book? Raun Kaufman is no longer autistic. Not an Asperger. Not anything but normal, thanks to the program his parents created. And I have been a Kaufman guru since 1976, when I read Son-Rise. Because of Son-Rise, I wanted to work with autistics, too – and I’ve been doing that for 28 This came across my desk as an audiobook, so of course I had to go track down the book. Raun is the same autistic child who was the focus of the book Son-Rise in the early 70’s. And the most amazing thing about that book? Raun Kaufman is no longer autistic. Not an Asperger. Not anything but normal, thanks to the program his parents created. Because of Son-Rise, I wanted to work with autistics, too – and I’ve been doing that for 28 years. Kaufman is the Global Outreach director for the Autism Treatment Center of America, in Sheffield, Massachusetts, the foundation his parents began to help others. You – yes you – can go there to learn the Son-Rise program or the Option method to help your own autistic child. In his book, Kaufman (son) outlines the basic tenants of the Son-Rise program. Son-Rise philosophy goes against modern ABA programming in that it sees autism as a social-relational disorder. Enter the child’s world, establish a social relationship, and then pull the child back with you into your world. Once you have social relations and communication, no matter how primitive, only then should you focus on educational goals. Being able to dress yourself on command without knowing why is little more than robotic. And the program works. Time and time again, with toddlers to institutionalized adults. This is a proven method. I’ve done it on short-term with institutionalized children, and I formed relationships with them like no one else could. I reached them, and I did not have even half the issues others had with them. Kaufman’s program can be adapted in person, but there are areas where I do disagree with him. Diet is one of them. If your child’s autism is cured by diet, then chances are it wasn’t autism to start with. While organic diets are wholesome and ideal for everyone, I do not recommend “assuming” your child has a difficulty with a food just because someone said so. I do not recommend filling your child with probiotics or supplements unless a doctor has proven there is a serious deficiency. Too much of the wrong thing can be just as bad as a lack of something, and not only are supplements unregulated, but certain vitamins can be toxic in large doses. In my experience with extremely hyperactive autistics, feeding them enormous amounts of carbohydrates *calmed* them tremendously – and then they were able to sit and learn without behavioral issues. If you’re so hyper you’re burning through 5,000 calories a day and you are constantly hungry, that hunger is only going to agitate you further. I also disagree with him regarding tantrums. If you have a child who is taking chunks – I mean actual pieces of flesh – out of themselves, you MUST respond. You don’t have to yell, but you can’t ignore it just to win trust. And right or wrong, the fastest way to end a tantrum is to join in. No, you don’t want to put a stamp of approval on a tantrum, but doing the unexpected breaks that cycle of “I’m tantrumming, now you have to do what I want.” Adults aren’t supposed to tantrum, and children, even autistic ones, know that. Kaufman also doesn’t mention honest-to-goodness physical issues, such as demonstrable brain atrophy, genetic issues (such as Rhett’s or Fragile X), or seizure disorders, which can truly mess up learning. There are many actual disabilities that have physical, non-curable causes that result in autistic-like behaviors, but no amount of anything is going to cure them. It gets their attention, and allows a moment for connected communication. While he does mention that you should not allow your child to do anything unsafe, such as running into a street, he makes no attempt to give guidance to parents whose children are severely hyperactive, sleepless, or self-injurious. If you’re spending most of your time chasing or avoiding biting, or up all night every night to make sure your child stays in the house, you’re not going to have a lot of time for forming social relationships. It’s wonderful, it works, but he glosses over the amount of time it takes to make the program work, and have even the most minimal semblence of a life. His own “cure” took a team of people working almost around the clock for more than three years. Most people can’t do that. Still, The Son-Rise Program is the one program for autistics I truly believe in. I’ve seen it work. Even in very small doses. In the end it needs no doctors, no therapists, no diets, no punishment, just the right support and understanding. Read it. Practice it, even on non-autistic children. He even includes chapters on dealing with Aspergers. With the severely autistic, even a 20% gain in function is the difference between life and lifelessness. I was thrilled to see a book written by Raun Kaufman. He doesn't know it, but his story changed the trajectory of my life 25+ years ago. I was in my bedroom, watching my black and white tv, when a movie came on that left me captivated, intrigued and with the absolute knowledge that I had just witnessed what I was meant to do with my life.. to work with autistic children. From that moment until I had my own children a number of years later, I read everything I could on the topic, volunteered throughout my college years at the lab school on campus, and worked with special needs children. I never forgot the story of Raun and the Son Rise program and periodically would look him and his family up online to follow their progress. That being said, I will give the book as unbiased a review as I can. Raun Kaufman uses this book as a vehicle to delineate the Son Rise program for home use. He manages to convey the information in an approachable way, with good humor and interesting examples. He doesn't hesitate to point out that it can be a challenge but offers plenty of encouragement and many, many ideas along the way. Each chapter closes with the points outlined and examples of ways to utilize each point in the home program. My gut instinct is that this program would work for every child. Would EVERY child be "recoverable" to the point of being called "neurotypical?" I doubt it. But then again, I don't think there was EVER a time in human history in which all persons were neurotypical. Don't we all remember that "hermit" or this guy who's "a little left of center" or "marches to his drummer?" I think the range for "normal" has gotten more narrow and that's not necessarily a good thing. Some diversity benefits all of us! That being said, I absolutely think that every person, every child and every human being, can benefit from being loved and accepted and met where they are. What a beautiful, beautiful concept. I don't know how the Son Rise program could/would work if it were implemented in any way other than full time. For example, I don't know how a child could go to preschool and also do this program. After all, most programs for children with autism would follow TEACHH or ABA or whatever the program is. So I'm guessing this would have to fall in the category of going all in, or not at all. I could be wrong about that. Maybe Raun or someone from Option will read this and weigh in with a comment. I think very highly of the Kaufman family and the Son Rise program/ Option Institute. I realize there has been controversy regarding it and probably always will be. Nonetheless, I've always wanted to go visit and really hope I get there someday. If you have an autistic child, are related to one, or know someone with an autistic person in their family, this is a great book to read. Every parent of autistic child should read it. When the book blurb reads, “This is the book that parents, professionals and educators of children with Autism have always wanted!” the book has a great deal to live up to and guess what, this one really does live up to the hype. I am an educator who has taught Autistic children in the regular classroom and I am a parent of a recently diagnosed child with Autism/Asperger’s Syndrome (February 2014), and I can tell you based on my research and reading on the topic this book is one of the best I ha When the book blurb reads, “This is the book that parents, professionals and educators of children with Autism have always wanted!” the book has a great deal to live up to and guess what, this one really does live up to the hype. I am an educator who has taught Autistic children in the regular classroom and I am a parent of a recently diagnosed child with Autism/Asperger’s Syndrome (February 2014), and I can tell you based on my research and reading on the topic this book is one of the best I have read on the topic to date. I say this after just having finished Tony Attwood’s The Complete Guide to Autism. Please keep in mind that Mr. Attwood is consider one of the leading Autism gurus or experts, if you will. What book am I referencing? 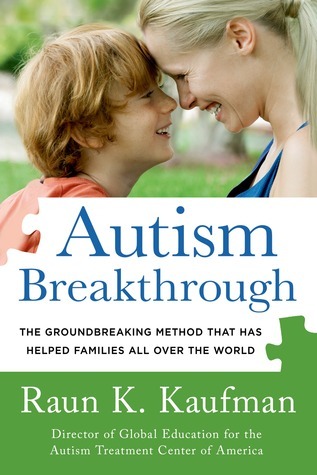 Answer: Autism Breakthrough: The Groundbreaking Method That Has Helped Families All Over The World by Raun K. Kaufman. Let me start by saying that Raun K. Kaufman confesses to having experienced a full recovery from Autism and let me add that this proclamation is somewhat controversial, but considering that it wasn't until 1980 that Autism was even on the research radar whose to say that it can’t be cured. I suggest laying aside the controversy that surrounds Kaufman’s Son Rise Program/ Option Institute and focus instead on the useful information that is to be discerned inside Autism Breakthrough. Information that parents, professionals and educators of children with Autism can use to help a child who suffers from Autism. This book is a tool for adults who chose to look at an Autistic child and, “...see possibilities not deficiencies,” and for those who want to create a truly safe environment where their child can grow and reach his or her full potential. Again as an educator and parent, I highly recommend this book to anyone wishing to understand and help those who have been diagnosed with Autism Spectrum Disorder. Thank you Net Galley and St. Martin's Press for the Advance Reader’s Copy of Autism Breakthrough: The Groundbreaking Method That Has Helped Families All Over The World by Raun K. Kaufman. I thought this book was very interesting, insightful, and thoughtful. The author was diagnosed with autism at an early age and Son-Rise method, which is joining the child in their world, helped Raun to overcome autism. In other words, instead of stopping or punishing the behavior, join in the behavior with the child. In the book, Raun goes more in depth with this topic, which is the cornerstone of the Son-Rise method, developed by his parents. Raun talks about the fact that autism is not a behav I thought this book was very interesting, insightful, and thoughtful. The author was diagnosed with autism at an early age and Son-Rise method, which is joining the child in their world, helped Raun to overcome autism. In other words, instead of stopping or punishing the behavior, join in the behavior with the child. In the book, Raun goes more in depth with this topic, which is the cornerstone of the Son-Rise method, developed by his parents. Raun talks about the fact that autism is not a behavioral disorder, it is a social-relationship disorder and that overcoming autism is not about getting your child to change his behaviors. Raun goes on to say that every autistic behavior your child exhibits is a symptom and that trying to stop these behaviors does not address the actual autism but only serves to seriously disrupt the trust and relationship between you and your child. I agree 100% with that assessment. Being a mom to a child with autism, I’ve learned the hard way that taking away or trying to change the behaviors that are deemed by society as “not normal” only hurt my son. The behaviors he exhibits, clapping his hands, and making high-pitched noises make him happy. Why would you want to take away your child’s happiness just because “society” says it is wrong? The book is full of information, analogies, true stories, suggestions, additional resources, everything you could want or need. There is also a chapter about Asperger’s Syndrome as well. While I am still skeptical about the idea of “curing” autism, I respect the author and the book. I learned a lot and it gave me several ideas I can try with my son. We all know that every autistic child is different but there are several chapters with different approaches to reaching your child that I think would be helpful for any parent with autism. A special thank you to the publisher for allowing me to read the book in exchange for an honest review. All conclusions reached are my own. This guy is an amazing writer. I mean this as a compliment when I say that I feel he could sell me anything. I know that is usually said of sleazy salesmen, but in this case I say that because the author knows that what he has got is the real thing and it really works better than the alternatives, and he can explain that in a simple, clear way. He makes it logical and obvious. It makes me want to read more by this author. I read this because I have son who was recently diagnosed with Asperger's. This guy is an amazing writer. I mean this as a compliment when I say that I feel he could sell me anything. I know that is usually said of sleazy salesmen, but in this case I say that because the author knows that what he has got is the real thing and it really works better than the alternatives, and he can explain that in a simple, clear way. He makes it logical and obvious. It makes me want to read more by this author. I read this because I have son who was recently diagnosed with Asperger's. That is only a small portion of Autism, so it only got one chapter of coverage in this book, but I knew that going into the book. we found it at the library, but part-way through the book we bought it so we could keep it and mark it up with notes. The approach in this book goes against commonly accepted thinking, but the author explains how and why it works better and backs it up with real life success stories and scientific research. I am convinced that the plan here works well, and I am anxious to use it with my son. I don't give out 5 star ratings very much, but this book easily earned it. The only down side is that it did seem to make the same point over and over, but I think that was necessary to drive it home. I encourage everyone who has someone close to them with autism to read this book and use the methods that it teaches. This book details the treatment fundamentals of the Son-Rise Program, which is used at the Autism Treatment Center of America. Raun, the author, is so upbeat and positive, it is impossible to resist his optimism. I know there are a lot of skeptics who flat out deny this treatment works (to the extent that they claim Raun is actually institutionalized...which Raun claims to be greatly exaggerated), but frankly, so much of the ideas he puts forth seem to be simple common sense way of parenting ANY This book details the treatment fundamentals of the Son-Rise Program, which is used at the Autism Treatment Center of America. Raun, the author, is so upbeat and positive, it is impossible to resist his optimism. I know there are a lot of skeptics who flat out deny this treatment works (to the extent that they claim Raun is actually institutionalized...which Raun claims to be greatly exaggerated), but frankly, so much of the ideas he puts forth seem to be simple common sense way of parenting ANY child, not simply one with autism. I actually got a lot of insight into myself reading this. I know autism and anxiety & OCD actually have some similarities (especially with regards to my brother and I and our tendencies towards self-harm). So much of it hinges upon fight-or-flight chemicals, over-stimulation, lack of control over situations, and lack of communication skills. All of those can apply to me, with my anxiety & OCD, AND with my brother and his autism. As a boy, Raun K. Kaufman was diagnosed by multiple experts as severely autistic, with an IQ below 30, and destined to spend his life in an institution. Years later, Raun graduated with a degree in Biomedical Ethics from the Ivy League’s Brown University and has become a passionate and articulate spokesperson for the Autism community. Raun K. Kaufman is now Director of Global Education of the Auti As a boy, Raun K. Kaufman was diagnosed by multiple experts as severely autistic, with an IQ below 30, and destined to spend his life in an institution. Years later, Raun graduated with a degree in Biomedical Ethics from the Ivy League’s Brown University and has become a passionate and articulate spokesperson for the Autism community. Raun K. Kaufman is now Director of Global Education of the Autism Treatment Center of America™.